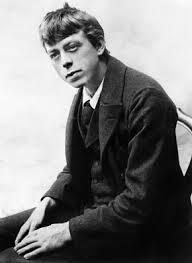 When people ask me if one can find any characters like the schlemiel in other traditions, I immediately think of Robert Walser. Indeed, I can think of no better example of the schlemiel than in his fiction. I can also think of no better person to write such fiction since he, too, was a schlemiel, a living schlemiel. He dreamed big but, like a schlemiel, he was unable to keep jobs or make his literary dreams come true. In the end, he was a bachelor schlemiel who lived his last days in a sanitarium. To be sure, Kafka found much in common with Walser: he loved Walser’s way of writing and, like him, he died a bachelor and, in many ways, a schlemiel. The first novel Walser wrote was entitled Fritz Kocher’s Essays. It was published in 1904. Daimon Searls – who translated the book for New York Review of Books press – points out that it “was a stroke of genius for Walser to launch himself at the reading public in the guise of an ‘impish schoolboy soliloquist’.” Citing Christopher Middleton, he describes the narrator, Fritz Kocher as “a fictional fellow in an old-fashioned frame narrative, dead in his youth and leaving to posterity only a collection of schoolboy writing exercises.” This, according to Searls, this plot “turned out to be the perfect vehicle for Walser’s unique energy, inventions, and oscillant ambiguities”(xv). Unlike Searls, who uses a frame for reading this which is based on what Matin Heidegger would call an “equipmental” sense of the artwork, I would like to suggest that we see the Walser’s fiction not simply a vehicle for his creativity but as a performance of schlemielkeit (a way-of-being-schlemiel). This performance brings one into a relationship with a character who resists school rules (law) – like Jerry Lewis – by being to submissive to them and, at the same time, admitting to his relation to the law. He is and is not anti-nomian. He doesn’t trash the law; he suspends it. And the narrator does this by acting like a man-child, a schlemiel. Walser does what many Yiddish writers – like Sholom Aleichem do – he plays the schlemiel in such a way that he lives in suspension between childhood and adulthood (between the world and worldlessness). Since Walser’s book is presented as a book that has survived a child who died before he grew up, and since it is introduced by someone who has put it together and published it, we can say that, in the wake of the child’s death, this book is a fictional initiation into a literary tradition. And the source of this tradition is a schlemiel by the name of Fritz Kocher: a child who speaks on adult things but died before he became an adult. He is suspended in time like many of Aleichem’s schlemiels or I.B. Singer’s Gimpel who will go from village to village trusting people – in hope that one day people will stop lying to and playing tricks on him. As one can see, the person who has saved the essays from oblivion is a very kind person. And, for this reason, the reader may feel safe to “trust” him. After telling us how the mother has agreed, he tells us about how these essays “may seem unboyish in many places, and all to boyish in others”(3). This suggest that sometimes Fritz sounds like a boy and sometimes he sounds like a man: he oscillates between the two poles. This way of reading him suggests a kind of schlemiel moment – a schlemiel temporality if you will – wherein the reader doesn’t know if what s/he is seeing is wisdom or sheer stupidity. The final words on Fritz Kocher – by the person who is publishing his work – deal with the fact that he, the “young, jolly laugher” was “destined to die young.” Like the schlemiels of the first Yiddish novel – The Adventures of Benjamin III by Mendel Mocher Sforim – who imagined they could see the world outside the Pale of Settlement but never left it’s boundaries – his eyes would never see “the wider world he so longed to reach”(3). This is how Robert Walser introduces himself and a new tradition which has fascinating resonances with the Yiddish literary tradition of the schlemiel.